Although it is possible for SMPP Asynchronous connections to process hundreds of SMS messages per second, sometimes there are performance gains by having more than one SMPP connection to the same SMSC. This is especially the case if the SMSC has per connection speed limits, or other performance limiting characteristics. 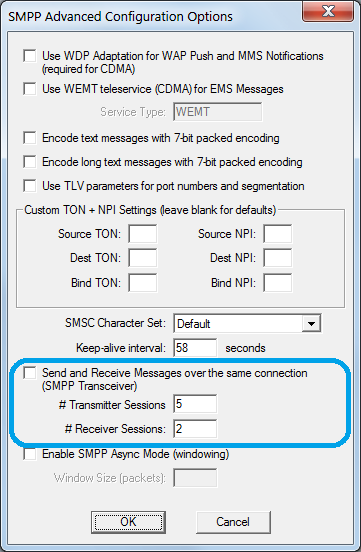 It may also be necessary to specify more than one SMPP connection to the same SMSC in order to process messages for more than one short code. In this latter case, you may need to specify different credentials for each SMPP connection. In this case, simply add a second (or third, or fourth…) SMPP connection, specifying the same server address. When NowSMS adds the connection to the SMSC list, it will automatically append “#2” (or #3, or “#4”) to the SMSC address in order to maintain separate settings for each connection. However, if you are connecting to the same SMSC multiple times using the same account credentials, it can be inconvenient to define the same connection multiple times. For this reason, NowSMS 2011.07.05 and later releases (see http://www.nowsms.com/category/updates) provide a configuration interface to define the number of transmitter, receiver and/or transceiver connections to be allocated for a single SMPP connection, without requiring multiple duplicate connections to be defined. If this transceiver mode is not enabled, the number of Transmitter and Reciever Sessions can be configured independently. These settings can also be manually configured by editing SMSGW.INI. TransmitterCount=## defines the number of transmitter connections to be established. If transceiver mode is configured, TransmitterCount specifies the number of transceiver connections to be established. If transceiver mode is not configured, ReceiverCount specifies the number of receiver connections to be established. Hi, We are getting the issue while sending the”sender number” with + (Example:+91999999999)and it’s says “Syntax Error” from SMSC. connection, please post in one of the forums labeled “Product Support Only”. If you are not using NowSMS, choose one of the general SMS and MMS technical forum.